Biography*: Harald Halfdansson (Old Norse: Haraldr Hálfdanarson; c. 850 – c. 932), better known as Harald Hårfagre English: Harald Fairhair), was remembered by medieval historians as the first King of Norway. According to traditions current in Norway and Iceland in the twelfth and thirteenth centuries, he reigned from c. 872 to 930. Most of his life remains uncertain, since the extant accounts of his life in the sagas were set down in writing around three centuries after his lifetime. A few remnants of skaldic praise poems attributed to contemporary court poets exist which seem to refer to Haraldr's victories against opponents in Norway. The information supplies in these poems is inconsistent with the tales in the sagas in which they are transmitted, and the sagas themselves often disagree on the details of his background and biography. Two of his sons, Eric Bloodaxe and Haakon the Good, followed Harald to become kings over extensive territories in Norway after his death. The only contemporary sources mentioning him are the two skaldic poems Haraldskvæði and Glymdrápa, which have been attributed to Þorbjörn Hornklofi or alternatively (in the case of the first poem) to Þjóðólfr of Hvinir. The first poem has only been preserved in fragments in 13th century Kings' sagas. It describes life at Harald's court, mentions that he took a Danish wife, and that he won a battle at Hafrsfjord. The second relates a series of battles Harald won. The facts offered by the poems may be scarce but it is a good source of information. His life is described in several of the Kings' sagas. Their accounts of Harald and his life may differ on some points, and some of the content may be uncertain but it is clear that he unified Norway into one kingdom. Some modern skeptics have generally assumed that his rule was limited to the coastal areas of southern Norway though there is no real evidence to support their claim. In Heimskringla it is written that Harald succeeded, on the death of his father Halfdan the Black Gudrödarson, to the sovereignty of several small, and somewhat scattered kingdoms in Vestfold, which had come into his father's hands through conquest and inheritance. His protector-regent was his mother's brother Guthorm. The unification of Norway is something of a love story. It begins with a marriage proposal that resulted in rejection and scorn from Gyda, the daughter of Eirik, king of Hordaland. She said she refused to marry Harald "before he was king over all of Norway". 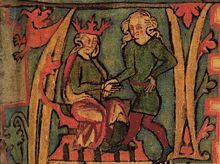 Harald was therefore induced to take a vow not to cut nor comb his hair until he was sole king of Norway, and that ten years later, he was justified in trimming it; whereupon he exchanged the epithet "Shockhead" or "Tanglehair" for the one by which he is usually known. In 866, Harald made the first of a series of conquests over the many petty kingdoms which would compose all of Norway, including Värmland in Sweden, which had sworn allegiance to the Swedish king Erik Eymundsson. In 872, after a great victory at Hafrsfjord near Stavanger, Harald found himself king over the whole country. His realm was, however, threatened by dangers from without, as large numbers of his opponents had taken refuge, not only in Iceland, then recently discovered; but also in the Orkney Islands, Shetland Islands, Hebrides Islands, Faroe Islands and the northern European mainland. However, his opponents' leaving was not entirely voluntary. Many Norwegian chieftains who were wealthy and respected posed a threat to Harald; therefore, they were subjected to much harassment from Harald, prompting them to vacate the land. At last, Harald was forced to make an expedition to the West, to clear the islands and the Scottish mainland of some Vikings who tried to hide there. The earliest narrative source which mentions Harald, Íslendingabók notes that Iceland was settled during his lifetime. Harald thus caused the Norse settlement of Iceland and beyond. Iceland was settled by "malcontents" from Norway, who resented Harald's claim of rights of taxation over lands, which the possessors appear to have previously held in absolute ownership. There are several accounts of large feasting mead halls constructed for important feasts when Scandinavian royalty was invited. According to a legend recorded by Snorri Sturluson, in the Heimskringla, the late 9th-century Värmlandish chieftain Áki invited both the Norwegian king Harald Fairhair and the Swedish king Erik Eymundsson, but had the Norwegian king stay in the newly constructed and sumptuous one, because he was the youngest one of the kings and the one who had the greatest prospects. The older Swedish king, on the other hand, had to stay in the old feasting hall. The Swedish king was so humiliated that he killed Áki. The latter part of Harald's reign was disturbed by the strife of his many sons. The number of sons he left varies in the different saga accounts, from 11 to 20. Twelve of his sons are named as kings, two of them over the whole country. He gave them all the royal title and assigned lands to them, which they were to govern as his representatives; but this arrangement did not put an end to the discord, which continued into the next reign. When he grew old, Harald handed over the supreme power to his favourite son Eirik Bloodaxe, whom he intended to be his successor. Eirik I ruled side-by-side with his father when Harald was 80 years old. Harald died three years later due to age in approximately 933. Harald Harfager was commonly stated to have been buried under a mound at Haugar by the Strait of Karmsund near the church in Haugesund, an area that later would be named the town and municipal Haugesund. The area near Karmsund was the traditional burial site for several early Norwegian rulers. The national monument of Haraldshaugen was raised in 1872, to commemorate the Battle of Hafrsfjord in 872. Halvdan Svarte (Haraldssøn), king of Trondheim. Torgils Haraldssøn - identified as "Thorgest" in the (dates not correct) Irish history. Snorri Sturluson, in his Heimskringla, claims that Torgils was Harald's son. Bjørn Farmann, king of Vestfold. Olaf Haraldssøn Geirstadalf, king of Vingulmark, later also Vestfold. Biography*: Halfdan the Black (Old Norse: Halfdanr Svarti) (c.?810 – c.?860) was a ninth-century king of Vestfold. He belonged to the House of Yngling and was the father of Harald Fairhair, the first king of Norway. According to Heimskringla and Fagsrkinna, Halfdan was the son of the Yngling King Gudrød the Hunter. Heimskringla also names his mother, as Åsa, daughter of King Harald of Agder, and his half-brother as Olaf Geirstad-Alf. Heimskringla relates that when Halfdan's father was killed, Åsa took the 1 year-old Halfdan and returned to Agder, where Halfdan was raised. When he was 18 or 19 years old, Halfdan became king of Agder. He quickly began adding to his kingdom, through political negotiation and military conquest. He divided the kingdom of Vestfold with his brother Olaf and, through military action, persuaded King Gandalf of Vingulmark to cede half his kingdom. Based on the formulaic nature of his ties to his predecessors, his strong affiliation with Agder, and the failure of an early saga dedicated to him to name any family connections, some scholars have suggested that the linkage to the earlier Yngling dynasty of Vestfold was a later invention, created to associate a conquering Halfdan and his son Harald Fairhair with the family glorified in the Ynglingatal, whom he had displaced. Halfdan next is said to have subdued an area called Raumarike. To secure his claim to Raumarike, Halfdan first defeated and killed the previous ruler, Sigtryg Eysteinsson, in battle. He then defeated Sigtryg's brother and successor Eystein, in a series of battles. This established Halfdan's claim not only to Raumarike, but also to half of Hedmark, the core of Sigtryg and Eystein's kingdom. These details are only mentioned in Heimskringla. Fagrskinna and Heimskringla both agree that Halfdan's first wife was Ragnhild, daughter of King Harald Gulskeg (Goldbeard) of Sogn. Halfdan and Ragnhild had a son named "Harald" after his grandfather, and they sent him to be raised at his grandfather's court. Harald Gulskeg, being elderly, named his grandson as his successor, shortly before his death. Ragnhild died shortly after her father, and the young king Harald fell sick and died the next spring. When Halfdan heard about his son's death, he travelled to Sogn and laid claim to the title of king. No resistance was offered, and Halfdan added Sogn to his realm. The narrative in Heimskringla then adds another conquest for King Halfdan. In Vingulmark, the sons of Gandalf of Vingulmark, Hysing, Helsing, and Hake, attempted to ambush Halfdan at night, but he escaped into the forest. After raising an army, he returned to defeat the brothers, killing Hysing and Helsing. Hake fled the country, and Halfdan became king of all of Vingulmark. According to Heimskringla, Halfdan's second wife was also named Ragnhild. Ragnhild Sigurdsdotter was the daughter of Sigurd Hjort, king of Ringerike. She was kidnapped from her home by Hake, a "berserker" who encountered her father in Hadeland and killed him. In turn, Halfdan had her kidnapped from Hake, so that he could marry her. Fagrskinna does not mention any of these details, but calls Ragnhild the daughter of Sigurd Snake-in-the-Eye, who in Heimskringlas version is her great-grandfather. Both sagas agree that Ragnhild and Halfdan had a son who was also named Harald. Heimskringla, Fagrskinna, Ágrip and Historia Norwegiæ all relate that Halfdan drowned when he fell through the ice at the inlet Røykenvik in the lake Randsfjorden on his return home from Hadeland. His horse and sleigh broke though ice weakened by cattle dung near a watering hole dug in the frozen lake. He was buried in a mound at Stein in Ringerike. Heimskringlas narrative adds that each of the districts of his kingdom wanted to claim his grave, and that it was agreed to divide his body into four pieces so each district could bury a piece of it, resulting in four different site called Halvdanshaugen (from the Old Norse word haugr meaning mound). According to this version, only his head is buried in Ringerike. No contemporary sources mention Halfdan, and the details of his life that are provided by later kings' sagas are considered semi-legendary by modern historians. Although he has his own saga in Heimskringla, it lacks any skaldic verse, which is normally used by Snorri as supporting evidence and this, combined with its rather legendary character, leads historians to be wary of seeing much veracity in it. The "Black" nickname was given to him because of his black hair. Biography*: Gisela of Burgundy (1075-1135), was a Countess consort of Savoy and a Marchioness consort of Montferrat. She was the spouse of Humbert II, Count of Savoy and later of Rainier I of Montferrat whom she married in 1105. She was the daughter of William I, Count of Burgundy. [S746] Wikipedia, online http://Wikipedia.com, http://en.wikipedia.org/wiki/Gisela_of_Burgundy,_Countess_of_Savoy. Biography: Otto (or Othon in French, Oddone in Italian) (1010/1020 – c.?1057) was a Count of Savoy from 1051 (or 1056) until his death. He substantially enlarged his lands through his marriage. After this acquisition the House of Savoy concentrated their expansion efforts towards Italy instead of outside the Alps as they had done before. Savoy's lands occupied much of modern Savoy and Piedmont, although several other small states could be found between them. He was son of Humbert, the first Count of Savoy, and his wife Ancilla of Lenzburg, and ascended the throne after the death of his elder brother, Amadeus I of Savoy. [S746] Wikipedia, online http://Wikipedia.com, http://en.wikipedia.org/wiki/Otto_I,_Count_of_Savoy. [S746] Wikipedia, online http://Wikipedia.com, http://en.wikipedia.org/wiki/Otto,_Count_of_Savoy. Biography: Adelaide of Susa (also Adelheid, Adelais, or Adeline; c.?1014/1020 – 19 December 1091) was the Marchioness of Turin from 1034 to her death. She moved the seat of the march from Turin to Susa and settled the itinerant court there. She was the last of the Arduinici. Born in Turin to Ulric Manfred II and Bertha, daughter of Oberto II around 1014/1020, Adelaide's early life is not well known. Her only brother predeceased her father in 1034, though she had two younger sisters, Immilla and Bertha. Thus, on Ulric's death, the great margraviate was divided between his three daughters, though the greatest part by far went to Adelaide. She received the counties of Ivrea, Auriate, Aosta, and Turin. The margravial title, however, had primarily a military purpose at the time and, thus, was not considered suitable for a woman. Conrad II, Holy Roman Emperor, therefore arranged a marriage between Adelaide and Herman IV, Duke of Swabia, to serve as margrave of Turin after Ulric's death (1034). The two were married in January 1037, but Herman died of the plague while fighting at Naples in July 1038. Adelaide remarried in order to secure her vast march to Henry of Montferrat (1041), but he died in 1045 and left her a widow for the second time. Immediately, a third marriage was undertaken, this time to Otto of Savoy (1046). With Otto she had three sons, Peter I, Amadeus II, and Otto. She also had two daughters, Bertha and Adelaide. Bertha, the countess of Maurienne, married the Henry IV, Holy Roman Emperor, while Adelaide married Rudolf of Rheinfeld, who opposed Henry as King of Germany. After 1060, Adelaide acted as regent for her sons. In 1068, Henry tried to divorce Bertha and consequently drove Adelaide to an intense hatred of him and his family. However, through the intervention of Bertha, Henry received Adelaide's support when he came to Italy to submit to Pope Gregory VII and Matilda of Tuscany at Canossa. Adelaide and Amadeus accompanied the humiliated emperor to Canossa. In gratitude for her mediation, Henry donated Bugey to Adelaide and her family and took back Bertha as his wife, returning to Germany. Adelaide later played the mediator between her two royal sons-in-law, Henry and the aforementioned Rudolf during the wars of the 1080s in Germany. She was an opponent of the Gregorian reform, though she honoured the papacy, and defender of the autonomy of abbacies. In 1091, Adelaide died, to the general mourning of her people, and was buried in the parochial church of Canischio (Canisculum), a small village on the Cuorgnè in the Valle dell'Orco, to which she had retired in her later years. In the cathedral of Susa, in a niche in the wall, there is a statue of walnut wood, beneath a bronze veneer, representing Adelaide, genuflecting in prayer. Above it can be read the inscription: Questa è Adelaide, cui l'istessa Roma Cole, e primo d'Ausonia onor la noma. Adelaide had passed her childhood amongst the retainers of her father and had even learned the martial arts when young, bearing her own arms and armour. She was reputed to be beautiful and virtuous. She was pious, putting eternal things ahead of temporal. Strong in temperament, she did not hesitate to punish even the bishops and grandees of her realm. She patronised the minstrels and always received them at her court, urging them to compose songs emphasising religious values. She was a founder of cloisters and monasteries that transmitted the history of the region. One failure of Adelaide's career was the loss of the County of Albon. Biography*: Garsenda or Garsende (II) de Sabran (c. 1180 – c. 1242) was the Countess of Provence as the wife of Alfonso II from 1193 and the Countess of Forcalquier in her own right from 1209. She brought Forcalquier to the House of Barcelona and united it to Provence. She was also a patron of Occitan literature, especially the troubadours, and herself wrote some lyric poetry and is counted among the trobairitz as Garsenda de Proensa or Proença. She was, in the words of her most recent editors, "one of the most powerful women in Occitan history". Garsenda was the daughter of Rainou (or Rénier), lord of Caylar and Ansouis of the Sabran family, and Garsenda, daughter of William IV of Forcalquier. She was named after her mother, who was the heiress of William IV, but predeceased him. Garsenda therefore inherited Forcalquier from her grandfather. She was only thirteen years of age when, in 1193, her grandfather William IV and Alfonso II signed the Treaty of Aix whereby Garsenda would inherit William's county and would marry Alfonso, who was in line to become Count of Provence. The marriage took place at Aix-en-Provence in July 1193. They had at least two children, Raymond Berengar IV and Garsenda, who married Guillermo II de Montcada, and bore him two children, including Gaston VII, Viscount of Béarn. In 1209 both William IV and Alfonso died and Garsenda became the natural guardian of their son and heir, Raymond Berengar IV. Initially her brother-in-law, Peter II of Aragon, assigned the regency of Provence to his brother Sancho, but when Peter died in 1213 Sancho became regent of Aragon and passed Provence and Forcalquier to his son Nuño Sánchez. Dissension broke out between the Catalans and the partisans of the countess, who accused Nuño of attempting to supplant his nephew in the county. The Provençal aristocracy originally took advantage of the situation for their own ambitious ends, but eventually they lined up behind Garsenda and removed Nuño, who returned to Catalonia. The regency was passed to Garsenda and a regency council was established consisting of the native nobles. It was probably during her tenure as regent (1209/1213–1217/1220) that Garsenda became the focus of a literary circle of poets, though the vida of Elias de Barjols refers to his patron as Alfonso. There is a tenso between a bona dompna (good lady), identified in one chansonnier as la contessa de Proessa, and an anonymous troubadour. The two coblas of the exchange are found in two different orders in the two chansonniers, called F and T, that preserve them. It cannot be known therefore who spoke first, but the woman's half begins Vos q'em semblatz dels corals amadors. In the poem the countess declares her love for her interlocutor, who then responds courteously but carefully. Under some interpretations the troubadour is Gui de Cavaillon, whose vida repeats the rumour (probably unfounded) that he was the countess' lover. Gui, however, was at the Provençal court between 1200 and 1209, pushing the date of the exchange forward a bit. Elias de Barjols apparently "fell in love" with her as a widow and wrote songs about her "for the rest of his life", until he entered a monastery. Raimon Vidal also praised her renowned patronage of troubadours. In 1220 Guillaume II de Sabran, a nephew of William IV, who claimed Forcalquier and had been in revolt in the region of Sisteron, was neutralised in part through the mediation of the Archbishop of Aix, Bermond le Cornu. By 1217 or 1220 Garsenda had finally ceded Forcalquier to her son and handed the reins of government over. [S746] Wikipedia, online http://Wikipedia.com, http://en.wikipedia.org/wiki/Garsenda,_Countess_of_Forcalquier.